In the 32 counties of Ireland-Derry/Londonderry is situated on the banks of the scenic Foyle estuary and is 115km from Belfast. It's own city is the second largest city in northern Ireland counties. In terms of its Ireland facts the county has a population of 250,00 people. It has many Ireland tourist attractions if you are planning an Ireland vacation and below are tips on places to visit if you are planning any Ireland tours. In the UK it was selected as the UK City of Culture in 2013. It has its own airport. The City of Derry Airport is a convenient landing place for sightseeing in this area rather than arriving to Belfast airports. Its convenience to County Donegal, Ireland, and to the Antrim Coast, makes it an ideal base for the tourist. Some gold was discovered in the Sperrins Mountains (that run around South Derry) around 1980 and mining has been carried out since 2007. It is believed that some ancient gold jewellery was made from Sperrins gold. The Glenshane Pass is on the road between Dungiven and Maghera, passing through Glenshane Forest. The pass becomes very treacherous during snow and cold weather and can be closed during the winter. County Derry-Londonderry was the centre of the shirt-making industry. In 1902, there were 38 shirt-making factories. 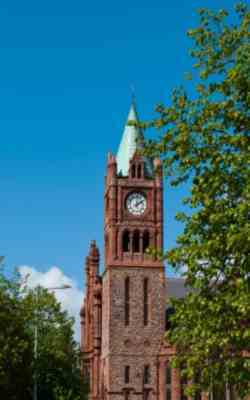 County Derry-Londonderry is situated on the River Foyle, which flows into Lough Foyle and thence into the Atlantic Ocean. Derry city is a walled city. The Walls, usually known as 'Derry's Walls', were built between 1613 and 1618. They have never been breached. Northern Ireland Counties of Antrim and Tyrone share a border and it also shares a border with Co. Donegal in the Republic of Ireland. 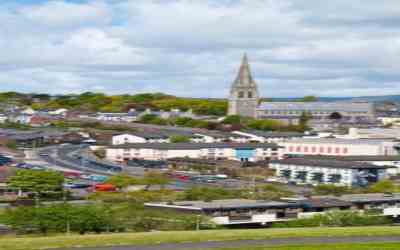 The following show some well known sights and pictures of Ireland from well known sights in County Derry-Londonderry that are included in many Ireland tours for those who visit Ireland. 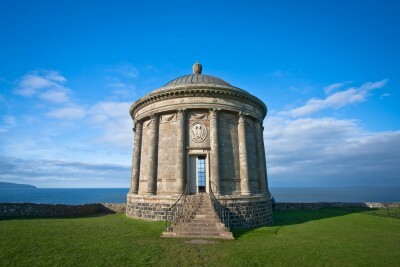 Mussenden Temple is located in the beautiful surroundings of Downhill Demesne near Castlerock. It sits on a 120 ft cliff top, high above the Atlantic Ocean on the north-western coast of Northern Ireland. It offers spectacular views westwards over Downhill Strand towards Magilligan Point and County Donegal and to the east Castlerock beach towards Portstewart, Portrush and Fair Head. City of Derry Airport www.cityofderryairport.com is about 13km east of Derry along the A2 towards Limavady. There are direct flights daily from City of Derry Airport to Dublin and Glasgow International (British Airways), London Stansted, Liverpool, Nottingham East Midlands and Glasgow Prestwick (Ryanair). The City of Derry Airport is very busy 2013 year being the first UK City of Culture and a near arrival point for the June 2013 G8 Nations summit to be held in Lough Erne. For more information on City of Derry Airport why not check out Cheap flights page to different airports in Northern Ireland. The Derry County Board of the Gaelic Athletic Association (GAA) or Derry GAA is one of the 32 county boards of the GAA in Ireland. Gaelic football is the most popular of the county board's Gaelic games. Derry GAA have won an All-Ireland Senior Football Championship in 1993, and Derry GAA have also won six National League titles and seven Ulster Championships. Derry City FC is a professional football club based in Derry, Northern Ireland. Derry City FC plays in the League of Ireland Premier Division. The club are the League of Ireland's only participant from Northern Ireland. Derry FC home ground is the Brandywell Stadium and the players wear red and white striped shirts from which its nickname, the Candystripes, derives. The Travelodge Derry Ireland is centrally located in the heart of the city with views over the river Foyle. The Travelodge Derry is situated on Strand Street which is popular for nightlife, restaurants, shopping and minutes walk from Derry City's many attractions. From the moment you arrive at the Travelodge Derry you will be greeted by the hotels friendly and professional staff, they will ensure to make your stay as pleasant and memorable as possible. The Lonely Planet voted Derry city the world's 4th best city to visit in 2013. The guide puts it fourth, behind San Francisco, Amsterdam, and the Indian city of Hyderabad. Tom Hall from Lonely Planet said Derry was a vibrant city and was undergoing a renaissance. Derry Ireland and its City of Culture year was a major reason for its fourth placing in the Lonely Planet list. Some key highlights are the London Symphony Orchestra, Primal Scream and David Holmes, Londonderry Musical Society’s ‘Annie’ and, one of the most eagerly anticipated events on the entire calendar Hofesh Shechter’s Political Mother: Derry-Londonderry Uncut. 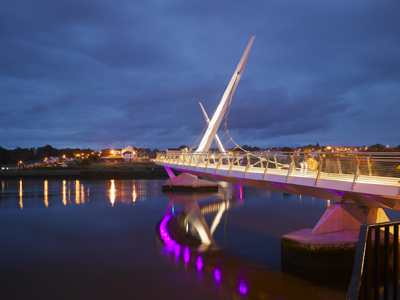 Since it was opened in June 2011 Derry Peace Bridge (now one of three bridges in the city) has become one of its main attraction to tourists and locals alike. Intended to bring together the people of different traditions living on both sides of the River Foyle, it has been a spectacular success. Derry City Walls only remaining completely walled city in Ireland and one of the greatest examples of a walled city anywhere in Europe. They were built in a five year period from 1613 as defences for the early 17th Century settlers from England and Scotland. A walk around the 1.5 kilometre circumference is a must for any visitor to the city and the view from the walls gives great views of the Renaissance style street. Today there are seven gates, the original four, Butcher Gate, Ferryquay Gate, Bishop’s Gate and Shipquay Gate, plus three other Magazine Gate, Castle Gate and New Gate which were added between 1789 and 1865. 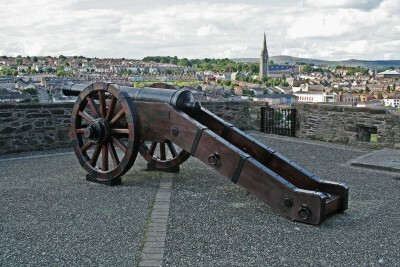 The Siege of Derry lasted from 18 April to 28 July 1689, during the Williamite War in Ireland. The city, a Williamite stronghold, was besieged by a Jacobite army in the Siege of Derry until it was relieved by Royal Navy ships. The Siege of Derry is commemorated yearly in August by the Apprentice Boys of Derry. Nestling just inside the walls is St Columb’s Cathedral which is one of the best pieces of architecture in the city. It is also the oldest building within the walled city and has been recently restored at a cost of £4 million. It is a cathedral with a treasure trove of historical interest. Its Chapter House Museum has a display of artefacts dating from the Siege of Derry in 1689. It is also home to the original padlocks and keys of the four original gates of the city walls. This is a small but powerful museum .It is an archive which focuses on the civil rights era of the 1960s and the early Troubles era of the 1970s. This Museum won several awards for innovation and you will begin to understand the divided history of Northern Ireland by walking the two roads of the country's history. Many people love the Tower museum. It's modern, and well designed but the most brilliant part some people find are the staff! They are so friendly, and unlike other museums are happy to walk around and give you the history of the town.You may just find an unexpected fantastic experience.